The Facility for Arts Research (FAR) will be accepting applications for its FAR Fellows Program, which will provide professional and creative support for one faculty member from each department in the CFA during the 2018-2019 academic year. A FAR Fellowship offers selected artists and scholars an opportunity to engage in collaborative experiments, develop or test new ideas, and engage in vital public dialogue from a home base at FAR on Sessions Road in Northeast Tallahassee. Proposals will be reviewed by FAR Co-Directors Denise Bookwalter, Rob Duarte, and Judy Rushin. The objective is to create an academically diverse and vibrant community that focuses on collaborative research and methods across a variety of disciplines and media. The FAR Fellows Program is open to applicants whose work takes a broad range of forms, encouraging applicants with from the departments of Art, Art Education, Art History, Dance, Interior Architecture and Design, and Theatre. A key element of any application will be the proposed collaborative idea. Applications should list collaborators and include description of their proposed collaborative project. FAR will provide office space and 24-hour access to the facility. 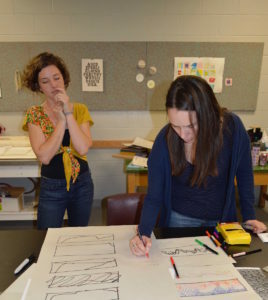 The College of Fine Arts will provide $500 in funding to support each accepted project.